I listened to John Kerry’s speech today and if you think a two state solution for Israel and Palestine will work, it seemed eminently reasonable. But the fundamental problem with the 2-state solution is that Palestine consists of 2 factions which will never see eye to eye – Fatah and Hamas. A 2-state solution would be self-destructive and would not accept Israel’s right to exist. A 3-state solution would only give two non-viable Palestinian states. Kerry’s speech was very defensive and his attempts to deny that the failure of the US to veto the UN resolution was anti-Israel were unconvincing, and sounded like rationalisation. It was not difficult to discern the personal vindictiveness (against Netanyahu) that Obama/Kerry were giving voice to. Kerry warned that the 2-state solution is in jeopardy – and so it has always been since it is based on wishful thinking rather than the realities on the ground. Earlier, US President-elect Donald Trump tweeted in support of Israel, saying he would not allow it to be treated with “disdain and disrespect”. He urged Israel to “stay strong” until he assumed office next month. On Friday, the US chose not to veto a UN Security Council resolution calling for an end to Israeli settlement construction, leading to an angry response from Israel. The 2-state solution is going nowhere and alternatives have to be found. But Obama and Kerry have no capability of thinking outside the rut. John Kerry and Barack Obama have a habit of choosing the wrong horse to back. After years of futile attempts to broker peace in Syria (after having first initiated and then encouraged the opposition to Assad), Turkey and Russia have managed to plan talks aimed at a nationwide cease-fire. That is something Obama/Kerry and the UN have not yet managed because they backed the wrong horse running in the wrong race. The new talks maybe have a chance because the US, the EU and the UN have been excluded. Turkey and Russia have prepared an agreement for a ceasefire in Syria, Turkey’s foreign minister said on Wednesday, adding that Ankara would not give up its opposition to President Bashar al-Assad staying on as leader. ….. Turkish minister Mevlut Cavusoglu’s comments appeared to signal tentative progress in talks aimed at reaching a truce. While the insistence on Assad’s departure could complicate negotiations with his biggest backer, Russia, another Turkish official did not rule out a transitional role for the Syrian president. Russia, Iran and Turkey said last week they were ready to help broker a peace deal after adopting a declaration in Moscow setting out principles that any agreement should adhere to. Russia has said the next talks are set for Astana, the Kazakh capital. …….. Last week, Russia’s foreign minister said Russia, Iran and Turkey had agreed the priority in Syria was to fight terrorism and not to remove Assad’s government – comments that suggested a shift by Turkey, which has long pushed for Assad to go. …… Russian officials have said invitations to participants for the Astana talks have not been sent out and the time has yet to be decided. The talks would not include the United States and would be distinct from separate, intermittent U.N.-brokered negotiations. Russia’s Foreign Ministry said on Wednesday that U.N. Special Envoy Staffan de Mistura had spoken by phone with Lavrov and supported the efforts to establish a ceasefire and new peace talks. Obama and Kerry have based too much of their foreign policy on wishful thinking – and wishful thinking supported by intelligence agencies producing reports, therefore, with a confirmation bias. They have given the administration just what they wanted to hear. In almost every instance (Iraq, Libya, Egypt, Syria, Yemen ….) they have provided what the US government wanted to hear and ignored the realities that actually existed. After the fanfare and hope and great expectations when Obama arrived 8 years ago, his departure is becoming a sad, graceless, spiteful, whingeing affair. He seems most interested in now trying to tie Donald Trump’s hands in the few weeks he has left. For the first time in at least 8 years, the US abstained and declined to veto an anti-Israel resolution at the UN Security Council. But the result will only serve to weaken the UN and pander to Trump’s desire to pull back from it. In Israel’s eyes Obama has clearly sided with the terrorists. After the United States abstained from voting, the U.N. Security Council on Friday passed a resolution demanding Israel stop building settlements on occupied Palestinian territory, a reversal of U.S. practice to protect Israel from United Nations action. The resolution was put forward at the 15-member council for a vote on Friday by New Zealand, Malaysia, Venezuela and Senegal a day after Egypt withdrew it under pressure from Israel and U.S. President-elect Donald Trump. Israel and Trump had called on the United States to veto the measure. It was adopted with 14 votes in favor, to a round of applause. It is the first resolution the Security Council has adopted on Israel and the Palestinians in nearly eight years. There are reports that the US State Department helped to draft the anti-Israel resolution. The Palestine issue can only be solved by Israel and Palestine. The UN is a distraction and this resolution is likely not only to be counter-productive but to weaken the UN itself (which may, of course, be a good thing). The US abstention was by Ambassador Samantha Power who has a history of being hostile to Israel. She was also in the news in April this year when an armoured jeep in her motorcade ran over and killed a child in Cameroon and declined to stop. Of course she apologised later. The I-Scan will be on commercial trials later this year and soon airport security will again be almost as unobtrusive and as non-invasive as it was before 9/11. The brain and its centres for emotion and cognition are increasingly becoming readable. Strong emotions create stronger brain waves and their characteristic brain-wave signatures are being “read” in ever increasing detail. Israeli research – which has been classified as a military secret for some time now – has shown that “malicious intent” has a characteristic signature of brain-waves and that the proximity of actions based on the “malicious intent” are clearly connected to eye and facial movements. The new malicious intention detector (I- Scan) is non-intrusive and is based on detecting and reading the brain waves of passengers as they simply walk through what looks like a door – albeit a rather thick door. The I-Scan is built into the surrounds of the 1 m thick door and identifies anybody who has “malicious intentions” by monitoring the emanations from the limbic centre of the brain – the amygdala. Within the limbic system is a small structure called the amygdala, a storehouse for emotional memories. It is also the area of the brain responsible for our “fight or flight” reactions, our natural survival instincts. The brain wave detector built into the I-Scan has to be within 80 cm of the subjects skull and detects a “malicious” signature within 20 ms. Malicious intentions show up clearly as tell-tale brain-waves, and together with facial muscle and eye movements, it can now be determined if the malicious intentions are also connected to actions planned for – or carried out in – a time proximity (about 3 hours) to the present (probability >99.99%). As the passenger walks through the door-scanner, an array of five cameras placed about 2 m ahead read the facial expressions and eye movements of the subject. The scanner has been tested extensively at 3 airports in Israel and now a corporation has been vested with the sole rights for commercialisation of the device. It is unlikely that the Israelis will make the technology generally available but they are expected to licence 2 or 3 US manufacturers. It is envisaged that everybody would walk through the intention scanner. Only those who triggered the scanner would then need to go through a conventional X-ray scanner. The luggage of these passengers would also need to be X-rayed. Even using a “safe” threshold would allow over 95% of all passengers to effectively experience no delay whatsoever. They would just walk through a door. The other 5% would still have to undergo the usual X-ray scanners and a pat-down. Most of these 5% would be false positives for “malicious intent” but but even these passengers would experience a much speedier process. It would allow the number of security staff at airports to be reduced drastically. “No hijacker or bomber or terrorist could conceal his intentions from the I-scan” said Dr. Jakob Malinowski of The Israeli University of Bio-Competence. “We have been developing the scanner for almost 10 years and it is now ready to be rolled out. It has already been on trial – secretly, and very successfully – at 3 airports. It is so unobtrusive that nobody has even noticed”. The scanner is now being produced by Bethmalion-I Ltd., at the rate of about 50 I-Scans per month. Production is being ramped up and it is expected that given a sufficient number of licencees, the I-Scan could have been rolled out to most “friendly” airports within 3 years. It is not expected that the Russians or the Iranians or others considered “unfriendly” will even be allowed to just purchase the I-Scan. I have always felt that every increase of security is a sort of victory for the terrorists. We will never return to the innocent days when there was no security, but the I-Scan could both simplify the entire security process and provide a much greater level of security. That will begin to redress the balance. It is expected that the I-Scan will have many other applications (concert halls, football stadiums, government buildings and the like). When the Israeli media themselves are disgusted, then the criticism cannot be just waved away as being ant-Semitic propaganda. To exult in and glorify the killing of a Palestinian toddler is not that far different to the obscenities of ISIS. The Judea and Samaria district police said on Thursday it opened an investigation into a video shot at a wedding which shows Jewish radicals stabbing a photograph of the Palestinian toddler who was killed in the Duma firebomb attack. A statement said the inquiry commenced a few days ago. The police said they were looking into the “numerous and serious offenses seen in the video,” including those who were careless with their weapons. The police intends to question those responsible and to revoke their gun licenses. The video shows Orthodox youths at a Jerusalem wedding singing songs of revenge and dancing with guns and knives. One masked youth holds up a firebomb, while another is seen stabbing a photo of Ali Dawabsheh, the toddler killed along with his parents in the West Bank arson attack earlier this year. Radicalised, young, orthodox Jews are just as much brainwashed as those from the most rabid madrassas. strongly condemned the “shocking images” displayed in a video recently seized by police, which shows Orthodox youths at a Jerusalem wedding dancing with guns and knives, stabbing a photo of Ali Dawabsheh, the toddler who was killed in the Duma firebomb attack that killed three members of the Dawabsheh family this past summer. This video filmed at an Orthodox wedding three weeks ago, Netanyahu said, exposes “the real face of a group that poses danger to Israeli society and security.” He then went on to bolster the Shin Bet, by saying that the images publicized in the video “attest to the importance of the Shin Bet to our security,” Netanyahu said. I particularly like this from B Michael in a Haaretz opinion column, even if his sarcasm is a little over the top. 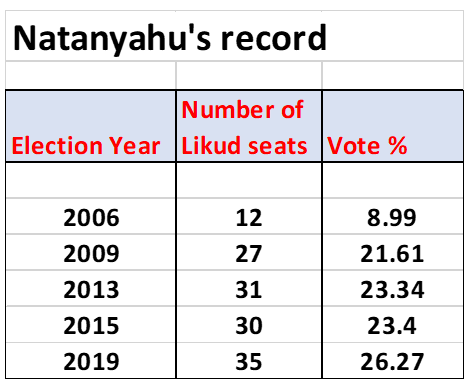 But with Bibi nothing registers if it does not go over the top. My heart goes out to Benjamin Netanyahu. With one cold, cruel stroke of the pen, the rulers of the world have taken away his most beloved toy – the apple of his eye and the joy of his heart, the rock of his existence and the source of his strength, and above all, the rock of his refuge and safe haven. Or in short, the Iranian bomb. 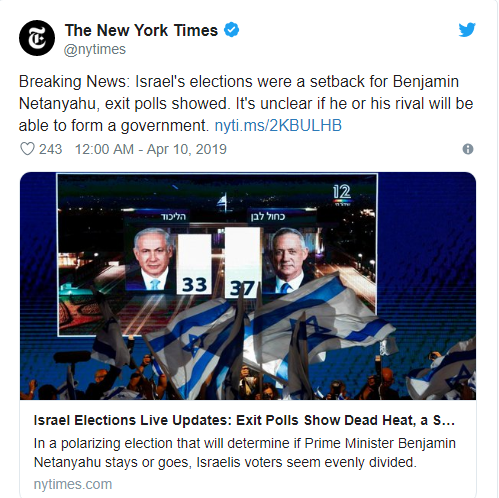 ……… From now on, Netanyahu is like a baby that has lost its security blanket, or like one whose favorite teddy bear was thrown into the garbage – the one that warmed his heart during the long nights and infused him with calm and serenity during times of trouble and election campaigns. But Bibi has an easy solution says Michael. He could just take one of Israel’s greater than 200 nuclear warheads and smuggle it into Iran and he can then rest easy that he can get back to crying “Wolf” whenever he has nothing else to say. But our hope has not yet been lost. If salvation doesn’t come from without, we will bring it from within, from ourselves. ….. As everyone already knows, the State of Israel – of course only according to strange foreign sources – has a respectable arsenal of atomic bombs that long since crossed the 200 mark. More than enough to destroy half the world. And here, in these surplus bombs, lies the solution to Netanyahu’s distress. All he has to do is take one of those 200 bombs of ours (according to foreign sources), wrap it up nicely in gift wrapping and give it secretly, as an anonymous donation, to the Islamic Republic of Iran. …… To anyone who fears the move might be discovered and embarrass us, don’t worry; nobody will notice the loss of one bomb out of 200. And even if a curious journalist does discover that one is missing, it’s not so terrible. As is the norm in such cases, Israel will grab the lowly guard on duty and cast him into purgatory the way one usually does with scapegoats, and that will settle the matter. And thus, everyone will once again be happy. But to be serious for a moment, bringing Iran back into the fold and creating a more balanced situation could be the best thing to happen in the Middle East for a long time. It is actually the 3-pronged balance between Israel, Saudi Arabia and Iran which gives hope. A military, political, financial and even a religious balance. Ultimately the Middle East has to find its own solutions for what constitutes “democracy” and of living together, without solutions being imported and imposed from Washington. An Egyptian proposal for a nuclear weapons free Middle East as part of the UN nuclear non-proliferation treaty (NPT) was blocked by the US, UK and Canada. The blockage was not unexpected since Israel which is not a signatory to the NPT had already indicated its opposition and on such matters Washington generally obliges Israel. The NPT 2015 conference ended without agreement and the US representative blamed the Egyptians – of course – for making a proposal that had no chance of success. The status quo continues and Israel can maintain all its nuclear warheads. The NPT conference will next be held in 2020. It is not so surprising that all the western countries which created Israel and now protect its not-so-secret stock of nuclear warheads are the same powers who don’t want any possibility of Iran developing its own nuclear weapons. I can quite accept that Israel will want to protect its own interests. The position of the US and its allies is entirely expected but is also just plain hypocritical. 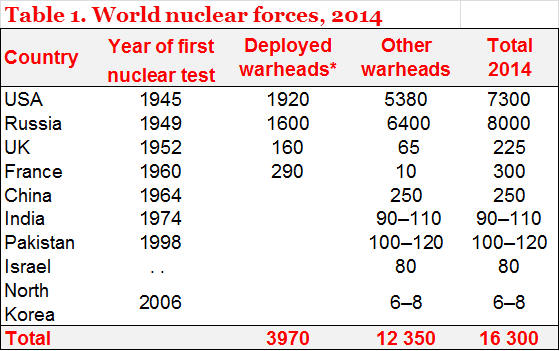 But the myth of Israel not having any nuclear warheads can be put to rest for ever. If they didn’t have any there would be no point in blocking the Egyptian proposal. Jerusalem Post: After four weeks of negotiations on ways to improve compliance with the pact, there was no consensus among its 191 signatories. US Under Secretary of State Rose Gottemoeller announced there was “no agreement” and accused some countries of undermining the negotiations. Gottemoeller did not name any countries but diplomats said she was referring to Egypt. ……. Last month, Egypt, backed by other Arab and non-aligned states, proposed that UN Secretary-General Ban Ki-moon convene a regional conference on banning weapons of mass destruction (WMD) as called for at the 2010 NPT review with or without Israel’s participation, without agreement on an agenda and with no discussion of regional security issues. Those conditions are unacceptable to Israel and Washington. Decisions at NPT review conferences, which are held every five years, are made by consensus. ……. Egypt’s proposals, Western diplomats say, were intended to focus attention on Israel. Washington and Israel say Iran’s nuclear program is the real regional threat. Iran says its program is peaceful. It is negotiating with world powers to curb it in exchange for lifting sanctions. Israel has said it would consider joining the NPT only once at peace with its Arab neighbors and Iran. There were disagreements on other aspects of the NPT but delegates said the Middle East issue was the most divisive. And in the meantime ISIS has announced that it is trying to get hold of one of the Pakistani warheads to be able to do something spectacular. The Israeli nuclear stockpile of nuclear warheads probably lies between 100 and 400. 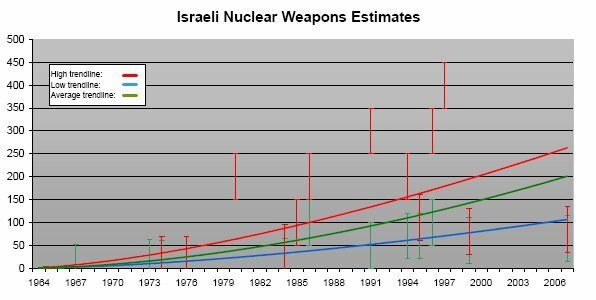 Estimates for Israel’s nuclear weapons stockpile range from 70 to 400 warheads. The actual number is probably closer to the lower estimate. Additional weapons could probably be built from inventories of fissile materials. It would seem that much of the Israeli objections to any US-Iran deal regarding Iran’s nuclear programme may be more of a negotiating ploy than driven by any real concern about their own security. Everything has its price and Israel also seems to have a price for swallowing their public objections. The price for acquiescing to any US-Iran deal seems to be the “purchase” of additional military aircraft and weapons systems from the US. Israel’s “purchases” of US equipment are paid for from moneys received as “US Defense Aid”. Currently Israel gets a recurring grant of around $4 billion every year augmented by many additional “one-off” grants. From this Haaretz article it would seem that Israel has determined the monetary value of the “pound of flesh” it requires to swallow its objections to any US-Iran deal. Israel has not failed to note that “According to Stockholm’s International Peace Research Institute, in 2014 Saudi Arabia bought $80 billion worth of weapons while the emirates bought $23 billion worth of arms.” It stands to reason that Israel’s total “price” will be something in excess of $100 billion. The US will not have missed in their calculation either that this will “enable” fresh, real sales of military equipment to Saudi Arabia and the Gulf States of at least twice that amount. ….. However, the Israeli defense establishment and the Pentagon have already begun preliminary contact on the type of defense package Israel would receive. Another incentive for these talks is the arms deals between the United States and the Gulf states, which have not waited for the final deal before acquiring defense systems designed to deter Iran. A well-placed source said that both countries have begun their “homework” ahead of such a deal. ….. The Israeli defense establishment estimates that the future weapons deal between Israel and the United States will include more F-35s. So far, the sides have agreed that Israel would buy 33 of these combat aircraft using U.S. defense aid. The first two planes are scheduled to arrive in late 2016. The first operational squadron of the planes will begin operations about two years later, with the last of the planes arriving in 2021. However the defense establishment believes this is not enough and hopes to acquire at least 50 of these fighter planes so the Israel Air Force will have two fully operational squadrons. Each plane in the current deal is priced at $110 million. Another key component in any future arms deal with Washington will be an anti-missile system. So far Israel has acquired an Arrow 2 system to intercept long-range missiles and nine Iron Dome batteries against short-range missiles. Next year, the David’s Sling system for medium-range threats is slated to go into operation. All these systems were funded with American defense aid and the United States has invested about $1 billion in developing interception missiles, above and beyond the $3.1 billion annual aid. Israel is also likely to request additional aid to finance an improved Arrow 3 battery and to acquire some more Iran Dome batteries. According to an analysis by the Knesset Foreign and Defense Committee from three year ago, which is also accepted by the army, Israel requires at least 12 or 13 batteries in order to effectively defend the country. Israel is also expected to ask the U.S. to allow it to buy advanced precision-guided munition, especially for the Air Force. The sides may also discuss the acquisition of technological systems for intelligence-gathering purposes. The defense industry in the US must be quite pleased. Is Backdoor Regin the US/Israeli successor to the Stuxnet virus? An advanced spying tool, Regin displays a degree of technical competence rarely seen and has been used in spying operations against governments, infrastructure operators, businesses, researchers, and private individuals. It is likely that its development took months, if not years, to complete and its authors have gone to great lengths to cover its tracks. Its capabilities and the level of resources behind Regin indicate that it is one of the main cyberespionage tools used by a nation state. The Stuxnet family was developed by the US and Israel and targeted the centrifuges at the Iranian nuclear fuel enrichment facility. Here too the second stage was deployed only after years of undetected operation with Stage 1. Only after years of undetected infiltration did the U.S. and Israel unleash the second variation to attack the centrifuges themselves and self-replicate to all sorts of computers. And the first version of Stuxnet was only detected with the knowledge of the second. ….. The target countries reported by Symantec suggest to me that like Stuxnet, the Backdoor Regin spying tool is a US / Israeli development. Posted in Behaviour, Israel, Politics, US | Comments Off on Is Backdoor Regin the US/Israeli successor to the Stuxnet virus?